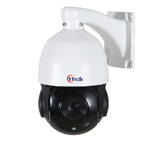 2.5'Dome Camera,4pcs ultra-brightness IR-III Array LED,with night vision of 45-50M;IP 67 waterproof and IK10 explosion-proof; Pan:350°,0-25°/s;Tilt:70°,0-20°/s;220 Preset positions,3 groups cruising scan( each group 16 preset、dwell time and speed selectable);IP66 Standard, Built-in 6000V Thunder Proof;HD-AHD Video signal,500M transfer distance. 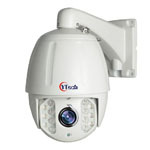 5.5' PTZ Camera,6pcs ultra-brightness IR-III Array LED,with night vision of 50-60M;Pan:360°,0-45°/s;Tilt:93°,0-30°/s,with Auto Flip;3 groups cruising scan;IP66 Standard;HD-AHD Video signal,500M transfer distance. 7' PTZ Camera,14pcs ultra-brightness IR-III Array LED,brightness can adjustable according zoom,with night vision of 120-180M;Pan:360°,0-45°/s;Tilt:93°,0-30°/s;220 Preset positions,3 groups cruising scan( each group 16 preset,dwell time and speed selectable);Support 360° Scan, AB Scan,positions Scan;Pan and Tilt position display;temperature cycle of design,automatic intelligent control cooling fan,heater;IP66 Standard, Built-in 6000V Thunder Proof;Wiper is optional;HD-AHD Video signal,500M transfer distance.